Very interesting book – I’ve thought some of these things but I don’t think I’ve ever read them – not put together like this, anyway. This book is about why what we refer to as the West has been the dominant power in the world in the last 50-60 years. 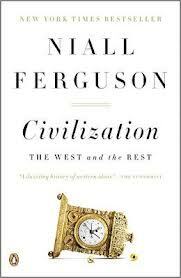 Ferguson has organized the material very well, it’s thoroughly readable (deliberately at a YA level) and although he digresses a bit much for my tastes, it’s all there for a reason – to re-examine history and find out why the West dominates. In the Preface it is stated there are 6 basic things the West did or went through since 1500 which prompted their success. These are items are then carried over into the chapter titles: 1) competition between and within the European states; 2) 18th century scientific breakthroughs; 3) the rule of law and representative government including individual property rights and governmental representation; 4) modern medicine as seen in the imperialist drives of Europe and the US; 5) the consumer society resulting from the Industrial Revolution; and 6) the work ethic promulgated by religion. The narrative unfolds in a generally chronological order. Ferguson is definitely coming from a pro-business, pro-West and economically conservative leaning point of view, but imo, it’s not overwhelming. He does see as a distinct possibility the collapse of the West’s predominance.